I feel in every smile a chain - Dr. John Wolcott. Bath University Group of researchers study human interactions. The study of this issue passed different stages in fast developing world. Special interest falls on technology development. 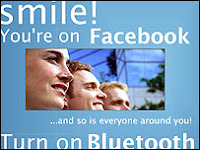 Scientists combine social network Facebook with communications tool Bluetooth. Combination gives opportunity to build new friendship networks. First thing to do, is to register with the Facebook tool, Cityware. Connection is accomplished via Bluetooth. This project is backed by Nokia, HP Labs and Vodafone. Tool helps people to interact with each other and choose contacts according to the information, profile provided by the Facebook. The tool works in four parts: Facebook account, Cityware application, Bluetooth device and Cityware node. After the users have Facebook account, they should install Cityware application followed by the registration process of the Bluetooth ID. The only thing we should do is to Smile and Turn the Bluetooth.